Did a low-mass supernova trigger formation of solar system? A research team led by University of Minnesota School of Physics and Astronomy Professor Yong-Zhong Qian uses new models and evidence from meteorites to show that a low-mass supernova triggered the formation of our solar system. About 4.6 billion years ago, a cloud of gas and dust that eventually formed our solar system was disturbed. The ensuing gravitational collapse formed the proto-Sun with a surrounding disc where the planets were born. 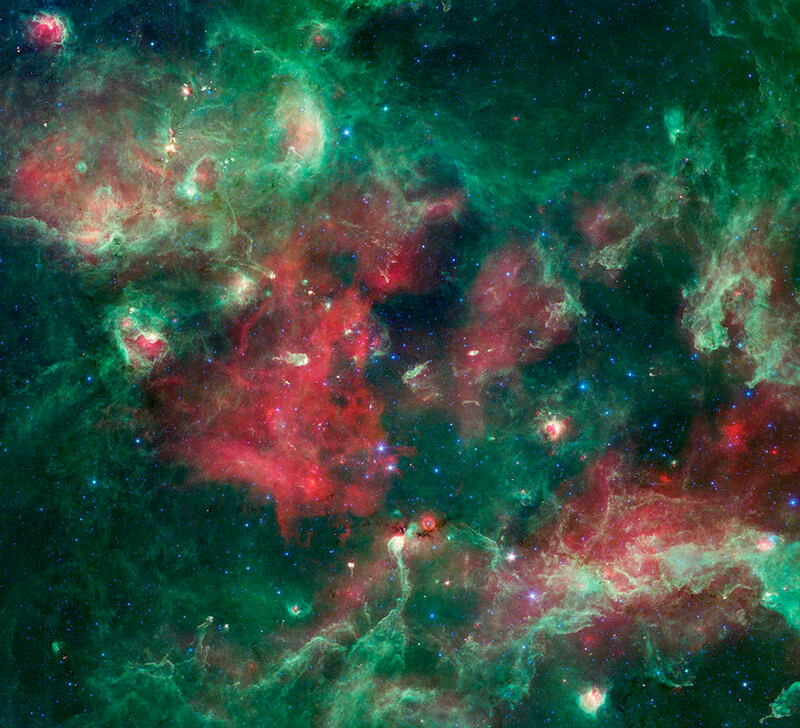 That cloud might be similar to some region in this much larger complex of gas and dust about 4,500 light-years away in the constellation Cygnus observed by NASA’s Spitzer Telescope. Another prediction getting closer to mainstream scientific confirmation for RS2 research. Maybe they DID read it... heck, they never credit aether researchers for "dark matter," do they? Now if they would only fix their time scales... 4.6 billion is more like 80 million. bperet wrote: Now if they would only fix their time scales... 4.6 billion is more like 80 million. What is the implication here? The radioactive decay rate method is not accurate? Is there a scientific basis for the 80M age? MWells wrote: Is there a scientific basis for the 80M age? "Err... can we just blame the black hole again?!" You could well be correct, perhaps they are reading up on them to gain more insight from other theories but unfortunately it looks like they are still trying to get their observations to fit the current, severly flawed, model of physics they still subscribe to. An international team, led by Giorgos Leloudas at the Weizmann Institute of Science, Israel, and the Dark Cosmology Centre, Denmark, has now made additional observations of the distant galaxy, about 4 billion light-years from Earth, where the explosion took place and they have proposed a new explanation for this extraordinary event. "We observed the source for 10 months following the event and have concluded that the explanation is unlikely to lie with an extraordinarily bright supernova. Our results indicate that the event was probably caused by a rapidly spinning supermassive black hole as it destroyed a low-mass star," explains Leloudas. In particular, the data revealed that the event went through three distinct phases over the 10 months of follow-up observations. These data overall more closely resemble what is expected for a tidal disruption than a superluminous supernova. An observed re-brightening in ultraviolet light as well as a temperature increase further reduce the likelihood of a supernova event. Furthermore, the location of the event—a red, massive and passive galaxy—is not the usual home for a superluminous supernova explosion, which normally occur in blue, star-forming dwarf galaxies. Thus, the team admitted that their research actually raised more new questions than it answered. "If you have poor observations, you can fit it with any model. But the more data we have, the more precise the theoretical model has to be. We don't understand the main peak of the light curve and we don't understand the rebrightening, though we have some ideas. As other scientists come up with theories about what could cause it, though, our data constrains the shape of the explosion the UV/optical flux, the X-ray flux, and the lack of hydrogen, which is the most common element in the universe," Brown concluded. "If you have a poor model of physics, you can make any poor observations fit..."
In the end the model must be useful to science, regardless of perceived potential. The papers must be rigorous, which is not an easy task. Otherwise, you are basically hand-waving which does nothing to advance practical knowledge and would actually serve to turn attention away. To understand a system of theory well enough that it intuitively suggests a better approach (in a particular area of research) is light years short of effectively explaining exactly why and how.